Now, I know I'm a romance writer, really I do. But I also kind of love horror movies. And I've always been a fan of cinematography and history. This year, I have expanded my repertoire of horror movies thanks to my new love, who is also a movie aficionado, and a fellow horror movie buff. We have set out to hit the major monster groups of horror movies between September and Halloween. We also have a similar obsession with popcorn. So as you can see, it all works out very well. We start with classics, and then we move forward. So far, we've started with zombies, and we've been watching some really cool but funky black and white movies from the 1920s and 1930s. We have an extensive list of zombie movies to watch, and after zombies, we will move on to vampires, and then werewolves I think. Through the course of our horror movies, we stumbled upon the original Phantom of the Opera, a silent movie in black and white, from 1925. It follows the storyline of the book fairly closely, with a few major differences, and it was a hell of a lot of fun to watch. It follows the story of young Christine, the ingenue opera singer, and her trials with the Phantom. http://www.imdb.com/title/tt0016220/ There's a bit more on the history of the movie here. I didn't realize that there had been a movie before Andrew Loyd Webber adapted the novel to a musical, and it was really cool to see the adaptation before the musical. 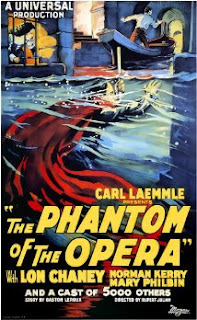 Because it was a silent movie, there was a musical track accompanying it that was beautiful in its own way, but I kind of missed the music of the Phantom that I've known and loved for so long. After the original, we watched the modern-day musical version, with Minnie Driver, Gerard Butler, and Emmy Rosum. It was great to see how closely the musical adaptation on screen followed the stage show, but also the really cool nods it made to the original film version. It blended a lot of the elements of the original movie, and even expanded on that dark seduction theme, which was great. And aside from the framework story line of the Raoul in the "present day" after the opera house was closed and ruined by the events, and the kind of extra sweet romantic ending, it stays pretty true to the stage production story. I for one prefer the less ambiguous ending of the newer film version. In the historical film, the Phantom is a lot less likeable, and a lot more like a monster. Here's where that whole romance author who loves horror movies comes into play! I like my Happily Ever After endings, and you don't always get those in horror movies... in fact, almost never. Yet... the new adaptation blends the old movie and storyline with the stage production in a new, interesting way, that I really enjoyed. Next on the docket will likely be Night of the Living Dead, and some other more classic zombie movies before we move on to Resident Evil and 28 Days Later and then lighter zombie fair like Zombieland. We'll also have some one-offs like Monster Squad, Little Monsters, and Hocus Pocus. Because it's just not Halloween without these movies! Stay tuned for more on a romance writers walk on the dark side.